The oldest and largest brewery in Summit County Ohio is expanding to a new location. “It’s something we’ve needed for a long time, to have a retail outlet for the brewery,” said John Najeway, owner. The brewery has been around since 1997, what better way to celebrate the 20th year in business than to open a brewhouse and restaurant with patio. Based in a 12,000 sq ft location at East Bank Flats, the brewhouse will be offering their regular brews, currently distributed in 15 states, and speciality microbrews available only at the Flats. Cleveland has been an historic “hub” for great brewers in Ohio including the Great Lakes Brewing Co. which started in 1988. 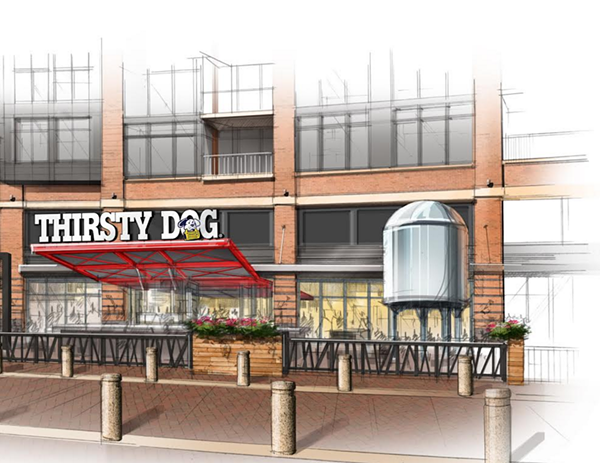 Thirsty Dog has earned World Beer Cup and Great American Beer Fest accolades. They offer 20 plus different brews. Crystal Structures is excited to be a part of this burgeoning brewhouse business! We’ll be providing the stunning glazed canopy (24′ x 22′) with red frame designed as a nod to the company’s red accented logo. The glazed canopy overlooks the bar seating area.